A sale has been agreed for an island off the south of Scotland coast where a lighthouse keeper was murdered by a colleague in 1960. Little Ross island near Kirkcudbright was put up for sale earlier this summer and attracted strong interest. It hit the headlines 57 years ago when Hugh Clark was shot by fellow keeper Robert Dickson. It is understood the island fetched significantly over its asking price of £325,000. 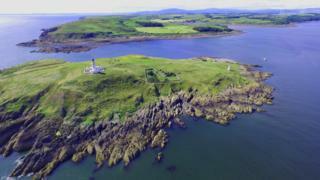 A spokesman for estate agents Galbraith confirmed there had been a dozen offers for the island, which covers 29 acres. The listing also included a six-bedroom, B-listed cottage and courtyard next to the operational lighthouse tower which was not part of the deal.